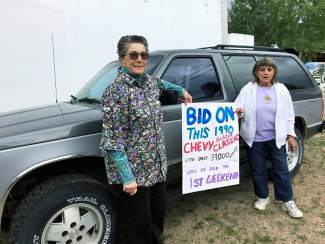 Barbara Jean and Vi Brown show off a 1990 Chevy Blazer with only 39,000 miles on it that has been donated to the Eagle Valley Community Fund Rummage Sale. It will be sold the first weekend of the sale, Aug. 15 and 16 at Maloit Park, which is located south of Minturn. Doors open Saturday at 6:45 a.m. and remain open for rummage sales until 5 p.m. Sundayâs hours are 8 a.m. until 5 p.m. The rummage sale continues the following weekend, Aug. 22 and 23, with everything for sale at half price. For more information, call 970-827-0426 or 970-476-5701.